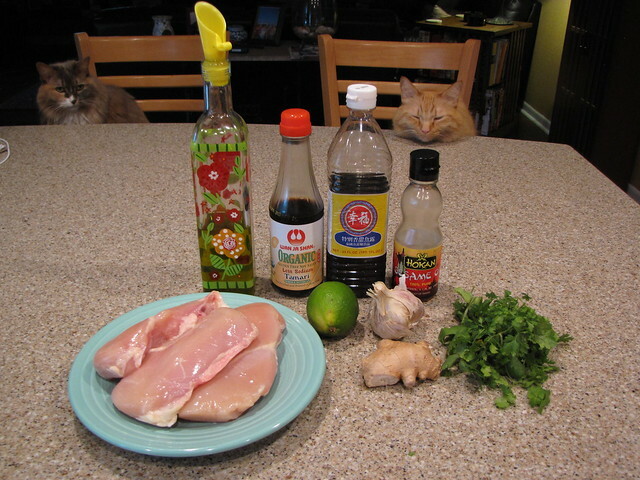 Sesame Ginger Lime Chicken hot off the grill. This recipe was a revelation. We’ve all grilled the infamous boneless, skinless chicken breast a hundred different times and if we’re honest, usually the result is slightly underwhelming. It’s pretty easy to get blah, semi-dry, chicken that we just cover up with our favorite BBQ sauce and call it a day. This chicken, however, was far from dry and really far from blah. A simple, Asian inspired marinade gives the chicken a huge flavor boost. Slightly pounding the chicken breasts into a flatter, more even thickness, helps them to cook quickly and evenly without drying out. Plan Ahead: This chicken is best when marinated for at least 1 hour. 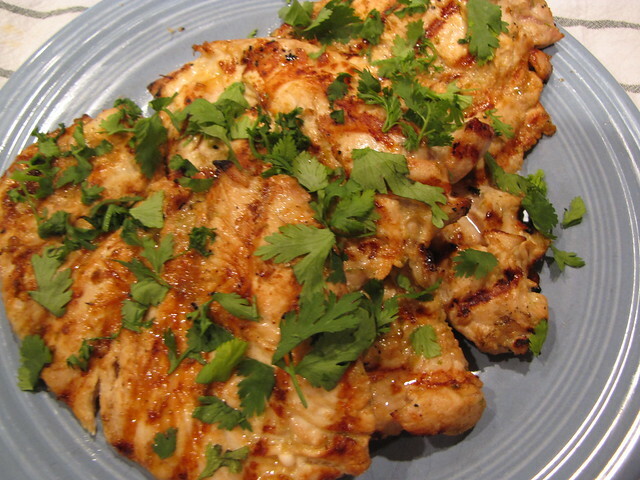 Pounding the chicken breasts slightly flatter helps them to cook quickly and evenly. This is NOT pounding them into super thin cutlets like you would cook in a pan. 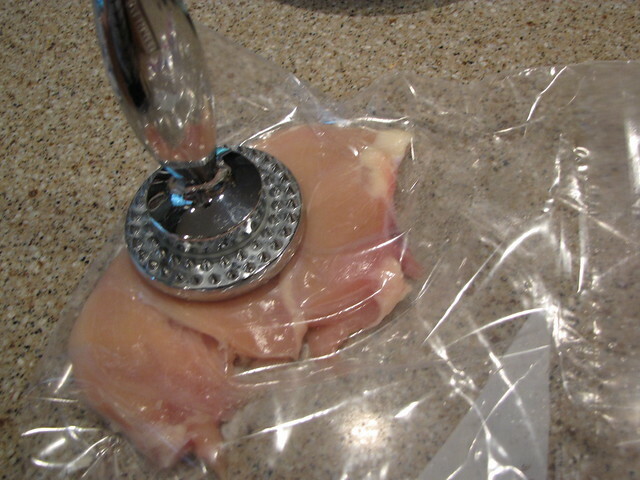 You only need a couple of good whacks on the thickest part of the chicken breast. I have 4 boneless, skinless chicken breast halves. Place them in a ziplock bag one at a time and give them about 4-6 whacks with a heavy meat tenderizer (not the spiky side) or mallet. You can also use a heavy can or heavy rolling pin. We only want the thickest part of the chicken pounded to match the rest of the chicken breast…about 1/2 inch thick overall. Don’t pound them thinner or they will tear and dry out. Flattened, these were about the size and thickness of my hand. 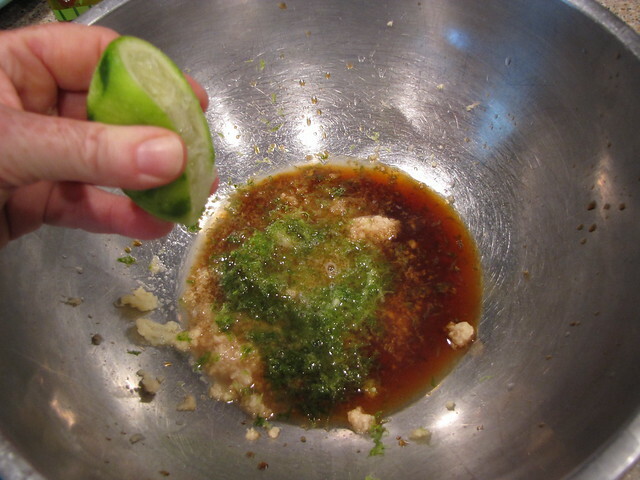 Build the marinade in a bowl big enough to accommodate your chicken pieces. 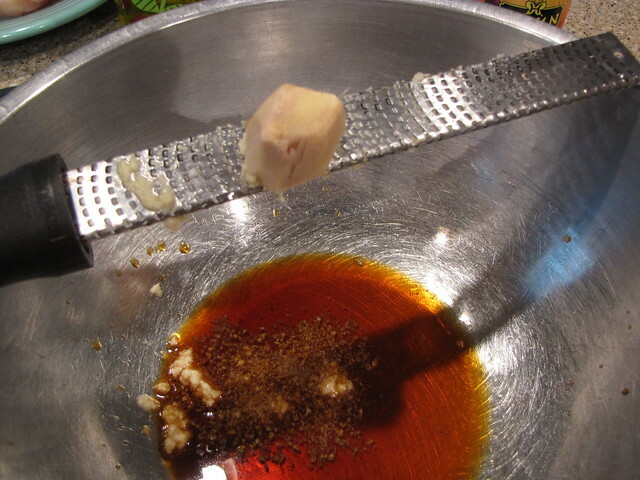 Combine 2 Tablespoons of Tamari (GF) or Soy Sauce with 2 teaspoons of Asian Fish Sauce. Grate in a 2-inch piece of peeled ginger. Don’t forget to scrape the ginger off the back of your microplane or grater. Grate 3 cloves of garlic into the bowl as well. Grate the zest off of 1 lime and then squeeze the juice of the lime into the bowl. Add 2 Tablespoons of olive oil and 1 teaspoon of sesame oil. 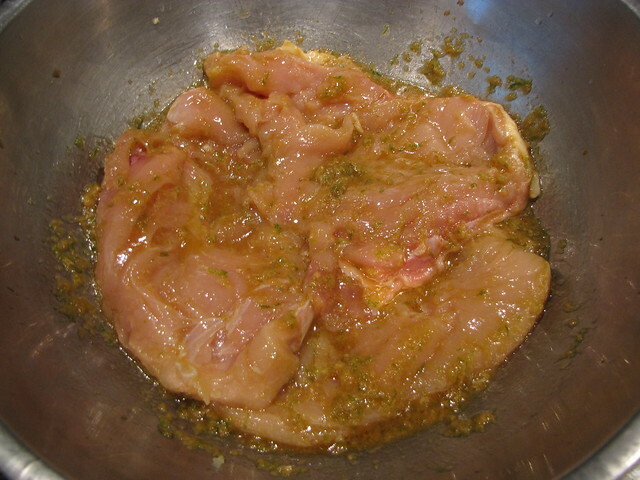 Add the flattened chicken breasts and massage them around in the marinade so that the chicken is evenly coated on all sides. Cover and refrigerate for 1 hour. If you want more flavor and can really plan ahead, the original recipe says that you can leave these in the marinade for up to 4 hours. When you are ready to preheat your grill, take the chicken out of the fridge (for at least 10 minutes) so that it can come up to room temp. 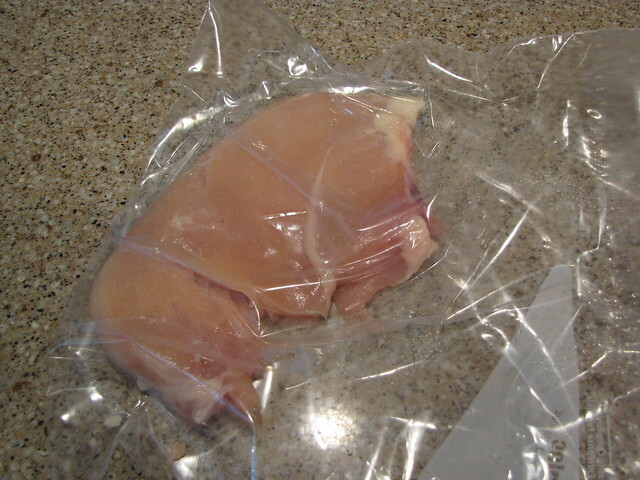 Remove the chicken from the marinade and pat to lightly dry with a paper towel. 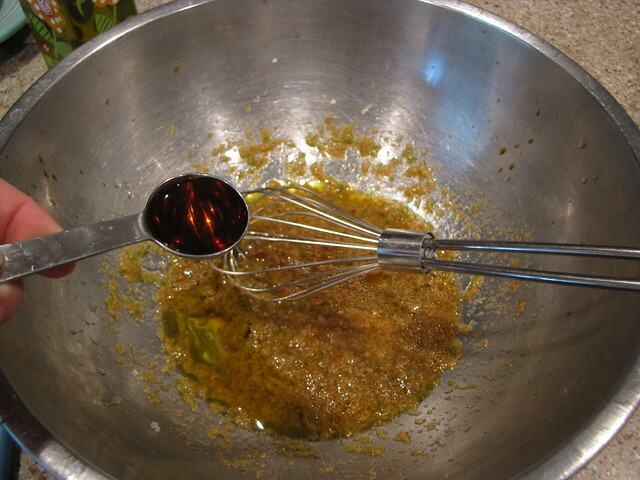 Discard the used marinade. Preheat your grill to high or build a pretty hot charcoal fire. 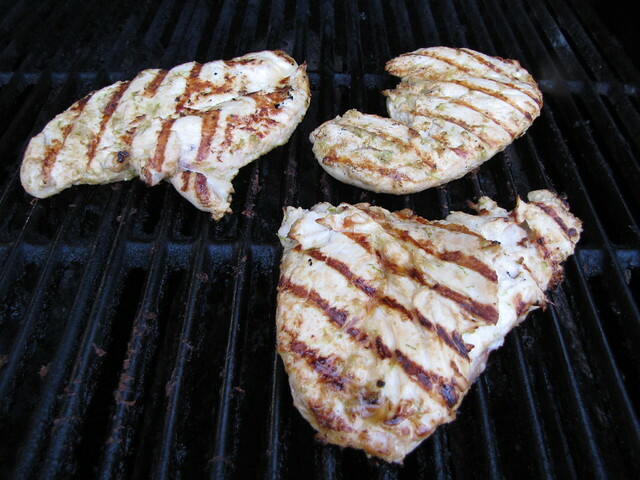 Spray or oil the grates of the grill so the chicken does not stick. Cook the chicken over a medium high heat for only 3-5 minutes. Once it has a good golden color and grill marks, flip it over for only 3-5 minutes more. Every grill is different but I grilled mine for about 5 minutes on the first side and only 3 on the second. Until you get the hang of this, it’s totally fine to cut a small slice into the chicken to ensure it is completely cooked through. Garnish with chopped cilantro (or parsley if you are a cilantro hater) and serve. This serves 4 but is easily doubled and makes a great leftover sliced up on a salad. 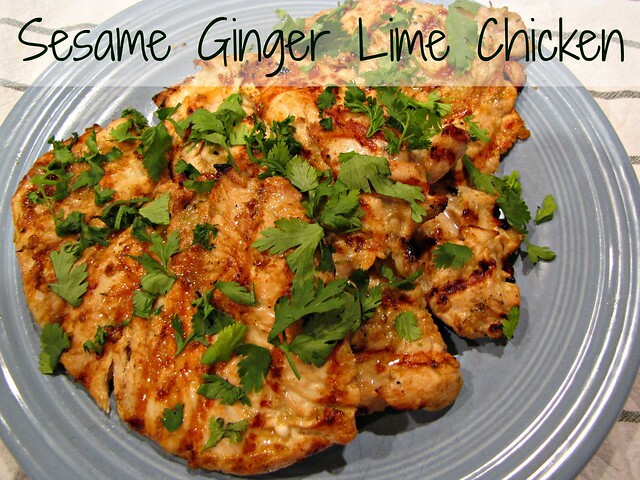 Sesame Ginger Lime Chicken is moist and immensely flavorful. Since it only takes minutes to cook, it’s great for a quick weeknight dinner. While the chicken is marinating, you can whip up one of our famous funky salads. If you want to stay with the Asian theme, I highly recommend the Snow Pea & Radish Salad posted last week. Now that I’ve been clued in to fattening out the chicken breasts for grilling, the flavor options are endless. This will be a fun summer chicken experiment! Excellent! I had to cook mine on the stove as we were almost drowned in a rainstorm but I will try it on the bbq next time. How did it go on the stove? I was also thinking that you could bake them in about a 350 degree oven or even finish them under the broiler for a little more color. This was the entree when Lovely Sister visited and cooked us dinner a few weeks ago. We wanted something tasty, but did not want to spend lots of time in the kitchen. This chicken is delicious and very moist. It requires a bit of prep work and time for the chicken to marinate, but it cooks up quickly since the chicken breasts have been flattened a bit. And, it was excellent paired with Greek Green Bean Salad. Another do-over!! UPDATE: I cooked this dish for dinner last night and ended up having to bake them in the oven. It worked! I baked them at 350 for about 15 minutes (in my old oven, they still had a bit of pink at about 11 minutes) and then put them under the broiler for another 3-4 minutes just to give them a bit of color. They were still moist and had great flavor. I prefer them grilled but baking works just fine. Thanks for the tip on making this in the oven!